We woke up early to the sound of birds, treating us to the music of the surrounding forest. A small touch to the glass window pane indicated just how cold it was outside, a reminder that autumn was already in full swing up in the mountains. We took our time that morning, cherishing every minute we had left at the old farmhouse. Warmed by a hearty traditional breakfast and plenty of hot green tea, we were ready to make a move. From Minshuku Yukaan, we paced ourselves through the quiet mountain roads that would eventually lead us to the other side of the Noto peninsula. The scenery along these roads was very different from the coastal route that we'd been following over the last few days. We passed through small farms and solitary homes nestled between woodlands and meadows. It wasn't too long before we encountered our first big climb of the day that would take us to the other side of the coastal mountain range. In comparison to the past few days, the weather was beautiful with clear blue skies and no sign of rain. We took a short break at the top of the climb to catch our breath before making our descent. The next 10 kilometers were extremely beautiful and exhilarating, coasting downhill through forests, farms and bridges crossing streams and rivers. As we came closer to the town of Anamizu, the road once again met the sea and we were now back on the coastline, but facing the eastern side of the peninsula. We made a scenic pit stop upon reaching Anamizu and had refreshments from the vending machines. One word about these clever contraptions in Japan: Amazing! You get a wide variety of choices, from isotonic sports drinks to coffee or tea, both hot and cold. I chose a hot coffee beverage and sat on the park bench to enjoy the crystal calm waters of Anamizu Bay. An old wooden fishing tower called Bora Machi Yagura stood silently in the waters of the bay. Local fishermen would use this fishing tower by sitting or standing on it while patiently waiting to catch bora (mullet). It didn't get more old school than that, a sublime portrait of time in these parts. 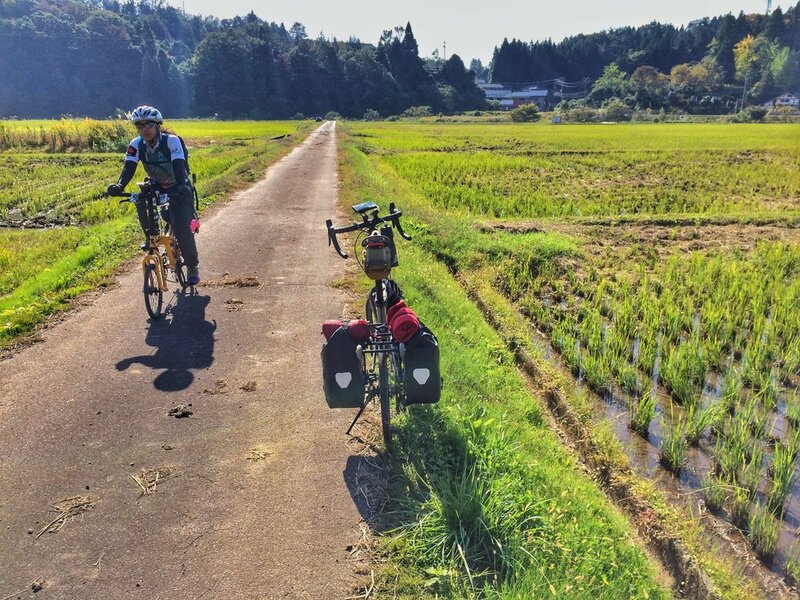 Moving on, we cycled through paddy fields close to the sea and enjoyed the stretch of flat terrain along with beautiful weather. By far, this day was the best and brightest of the entire tour, so we took our time to soak in the sunshine, even in the cold autumn temperatures. 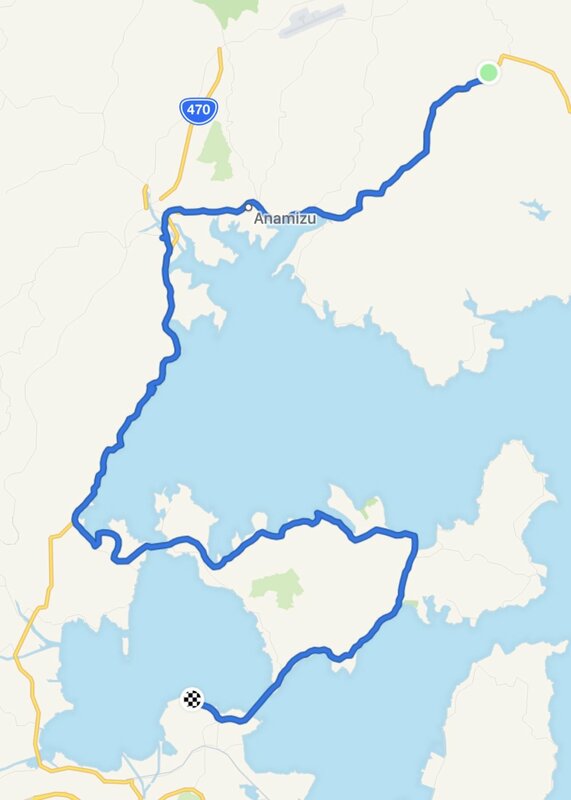 There were a few small climbs as we passed through the coastal farm lands and finally arrived at the town center of Anamizu. The wonderful thing about cycling and traveling is that you have the freedom to stop wherever and whenever you feel like it, especially to catch unexpected moments. And of course, the unexpected moment that brought on smiles was food! Cycling through Anamizu, we stumbled upon the weekend morning market, where the smell of fresh food enticed our senses. We made our customary food stop and enjoyed freshly prepared takoyaki. During the quick snack, some locals caught sight of us and our Birdy bikes, striking up a conversation about our travels despite the normal language barrier. It was a wonderful morning to say the least. It was a good thing that we stuffed ourselves with a bit of food, because the rest of the day's journey would be full of climbs, and as we discovered later on, the most that we'd ever do in a day. Packed with carbs, we continued down the coastal route and stopped at an intriguing Shinto shrine for another scenic break. The shrine was enclosed in a solitary grove of trees, jutting into the sea and somewhat removed from the rest of the land mass. The route that we would take to get to Wakura Onsen went through Notojima island, giving us the opportunity to cross the two bridges that connect the island to the peninsula. Before reaching the bridge, we stopped at a small fishing village to examine the map, and enjoyed a small cheese onigiri snack (pictured on the right), a delicious souvenir from Minshuku Yukaan. From there, we had two choices: another big climb, or cycle through rugged camping grounds. We chose the latter and went through a gravel path that was supposed to be a "shortcut" to get us to the bridge, but it ended up being our first experience of a mini gravel cyclocross on small wheels. The forest surrounding the camp grounds was deserted but quite beautiful (pictured at the top banner). 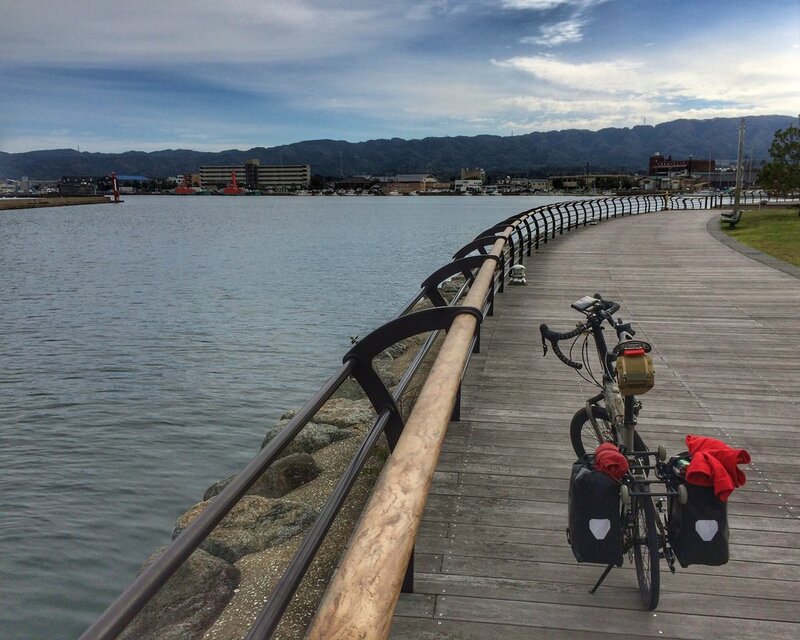 Cycling across the twin suspended bridge into Notojima gave a beautiful panoramic view of Nanao Bay. We took a few quick stops on the bridge to appreciate the view before crossing into the island. Almost immediately upon reaching the island, we were given a strong clue about what the ride here would be like. A yellow road sign with the universal gradient symbol at 8%. And there were quite a few of these. Notojima island itself was formed from a volcano, and this geographical feature was clearly on display as we navigated through sudden climbs and drops all the way throughout. It was one of the more challenging rides we've done to date, and the most climbing we'd ever had the chance of experiencing in just a few hours. Right when we thought that we'd conquered a climb, the next corner presented us with another, and another, and at some point we all broke down in hysterical laughter at the thought of a never ending uphill climb. Eventually, we reached the end of the dragon's back as we crossed the next bridge towards Wakura Onsen, our final destination for the day. Notojima Aquarium. This aquarium has the largest water tank along the Sea of Japan and is home to more than 40,000 animals, including a big whale shark. Notojima Glass Art Museum. A unique glass art exhibit on the island showcases sculptures that are both classical and modern and even has a glass factory that shows how its done. Swim with wild dolphins! We really wish we could have done this, but perhaps there might be a next time! But clearly, we were simply looking forward to soaking in an Onsen bath to ease our aching muscles after all the climbing. Wakura Onsen is a resort town in Ishikawa famous in the region for its Onsen waters for the last 1,200 years. According to legend, a traveling priest came across an injured crane that healed itself by bathing its wing in the waters of the hot spring. Ever since then, a resort town has sprouted around the hot spring and today, the healing waters are channeled to several public baths as well as hotel resorts. Noushu Iroha was our accommodation for the night, where we were greeted with beautiful traditional music played by a talented koto musician. We parked our bikes inside the entrance and were ushered in. As we were introduced to the facilities of the resort, our hostess politely pointed out that their public Onsen was clearly marked blue for the men, and red for the ladies. Just in case. Fortunately we did not have to worry about that as our room had a private Onsen on the balcony, overlooking the waters of Nanao Bay. Without further ado, it was Onsen time, followed by dinner, and bedtime on traditional futon mattresses with the sound of the sea lulling us to sleep. There's nothing better than soaking in your own private Onsen, especially after several days of riding against strong headwinds and up the mountains. Since check out was only at 10am, we maximized our time in the Onsen. So there we were, enjoying the waters from the hot spring channeling into our bath on an autumn morning by the sea – a perfect combination. With our muscles soothed and bellies filled with food, we started our journey for the day. We would be following the seaside road from Wakura Onsen to the center of Nanao. Nanao (七尾) is the largest city in the Noto Peninsula, offering plenty of scenic views. We followed the bike path that brought us towards the middle of the waterfront to briefly enjoy the views of the bay before moving on. The bike path eventually connected back to the main road, and we followed the signs to Highway 160 that would finally bring us to the other side of the Noto Peninsula. We would face our big climb for the day on Highway 160, taking us through the mostly forested mountain road. At this point, we were re-energized and the climb did not feel as difficult as the previous days. After going across the mountain top, we made our descent towards the coastline facing Toyama Bay, a most spectacular view. By mid-afternoon we had arrived at the Amaharashi coastline of the Noto Peninsula. To our right were beautiful pine forests that defined the interior of the coastline, and to our left was the beautiful and open view of the sea and sandy beaches covered by a line of wave breakers. Across the waters, we could see the majestic Tateyama mountains rising above Toyama Bay. The view of these mountains change according to the seasons, and it is no wonder that in classic Japanese literature, the poet Otomo no Yakamochi often wrote of the beauty of Amaharashi throughout the seasons. In the late 12th century, Yoritomo Minamoto founded the government of Kamakura, and Yoshitsune Minamoto, Yoritomo's half brother, was there with him to give merit. An unfortunate series of events however set the two of them against each either, and Yoshitsune was later branded an enemy of Kamakura administration. Yoshitsune fled towards the Tohoku region, during which he came to this particular coast. It was raining heavily, so he had to wait until the skies cleared to continue on his journey. "Amaharashi" simply means "to stop raining." And as the poets of ancient Japan have written, the Amaharashi coast was breathtaking indeed. Even though the weather gave us plenty of rain as the day progressed, there was much natural beauty to be appreciated as we rolled through rustic seaside towns along the way. 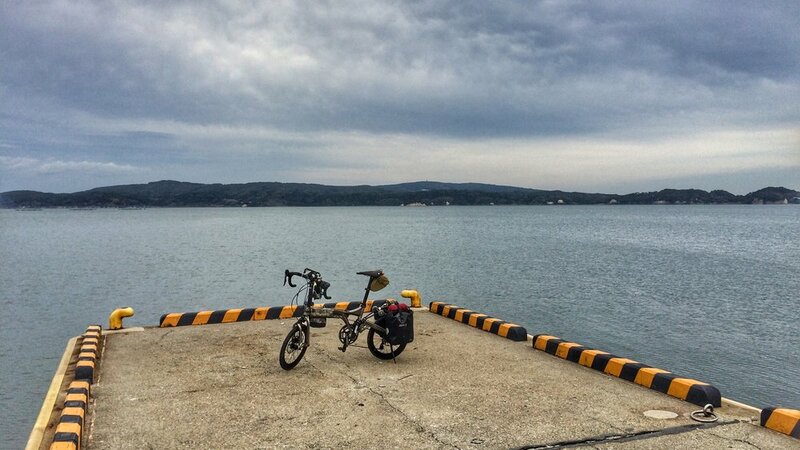 Cycling tour - An afternoon in Himi from Folding Tales on Vimeo. We followed the road along the coast and took the opportunity to explore the town of Himi, which happened to have a few notable places of interest. We made a pit stop at the Himi Seaside Botanical Garden and continued along the path by the beach. Eventually it was time to bid farewell to the coast to make our way inland towards Takaoka. Cycling back to the interior, the landscape changed dramatically as we returned to the urban boundary. The outskirts of Takaoka were mostly industrial areas, so we were cycling through several refineries and factories of different types. This was a port city after all, and it was expected to see a lot of shipping cargo heading in and out of the area. The sun quickly dipped beneath the horizon as we cycled further into Takaoka. 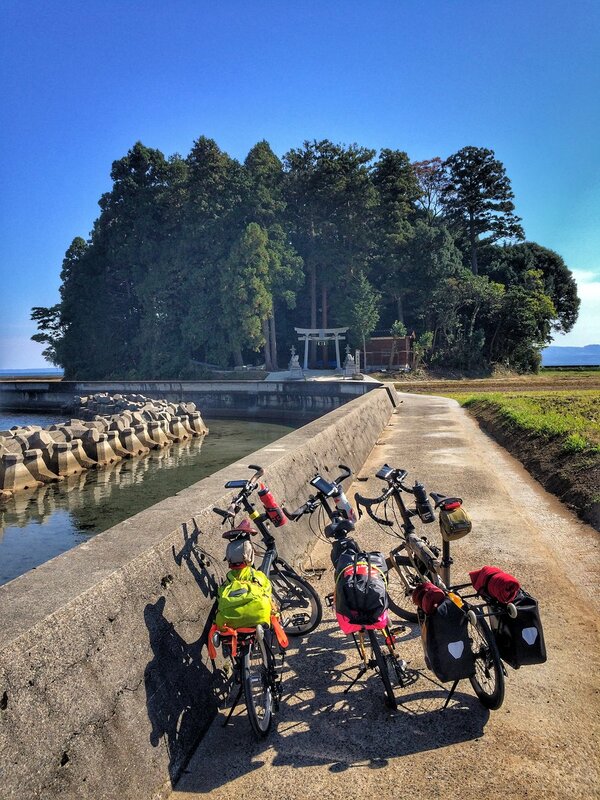 To avoid areas with heavy traffic, we took the bike path that traversed alongside the Oyabe river. It was getting rather dark, so we had our bike lights on and were focused on the road in front of us. The bike path eventually turned into gravel and that was our cue to turn out of it and find our accommodation. Our homestyle ryokan was aptly named Daibutsu Ryokan as it was literally a stone's throw away from the Takaoka Daibutsu. Our big suitcase was waiting at the ryokan, containing the padded bike bags that we would use for the train ride tomorrow morning. As it was raining, the kind elderly gentleman who was the host of the ryokan helped us park our bikes in a protected area across the road. The Takaoka Daibutsu is said to be "one of the three great Buddha statues of Japan" along with the Daibutsu in Todaiji Temple in Nara and the 13m-tall Great Buddha statue in Kamakura. This giant Buddha statue in Takaoka stands to a height of almost 16 meters and weighs 65 tons. It was built using traditional copperware techniques, a skill that is special to the Takaoka area. The city also happens to be a major producer of copper bells and other copper ornaments for temples around Japan. If you're interested to see the location of the other Daibutsu, there's a page on Wikipedia that lists them all. It was an extremely rainy day and as much as we would have liked to spend the morning doing a bit of sightseeing around Takaoka, the weather simply did not allow it. For those who have the opportunity to travel to Takaoka on fair weather days, we highly recommend making a stop at the Zuiryuji Temple. Instead, we made our way to a bike shop near the train station to patch a puncture on Nadiah's front tyre. Somehow, Nadiah caught a metal shaving most likely while cycling along the industrial areas of Takaoka from the night before. With the patch firmly in place, we proceeded to the train station and packed our Birdy bikes into their respective bags after drying them off from the rain. After coffee at the train station, we bid our farewells to the Noto Peninsula. At the designated platform, we loaded our covered bikes into the train for the journey to our final destination that signalled the end of our tour, the mountain town of Takayama.